I am stunned by the news on Facebook that musicologist and my close friend Bob Gilmore has died at age 53. He had survived a bout of cancer when I saw him two years ago in Amsterdam and London, and was physically reduced, but last I’d heard he was on the road to complete recovery. What a loss! He was not only a superb scholar (biographer of Harry Partch, anthologizer of Ben Johnston) but an incredibly irreverent spirit, incisive and fearless. 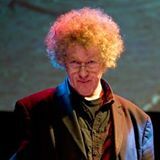 I’ll never forget, after corresponding with him for years, pulling into Dartington, England, on the train and seeing his wild red Irish-fro emerge from the crowd – and then having to quickly acclimatize myself to his irrepressible personality. Two days ago I bought his new biography of Claude Vivier, and was planning to write about it here. I had never much warmed up to Vivier, but one evening in Dartington Bob took me back to his apartment and gave me the crash course, scores and recordings of the most striking works. I was fairly convinced, and added Vivier to my teaching repertoire. Bob was a walking intellectual’s party, his wit, sarcasm, insight, and appreciation of drink and conversation irresistibly sweeping one back into 1920s Paris (or more apropos, perhaps Shaw’s London). The times I could tell you about – in Dartington, where he brought me to teach twice, we drank for hours at a bar that had been there since the 15th century. And consider the musical intellect that could smoothly segue from Partch and Johnston to Vivier. I can’t picture a world without him. I can’t imagine that long, rippling, sardonic laugh ringing out no more. His son played my violin concerto at Dartington (very beautifully) and Benjamin’s grandfather (Bob’s father-in-law) Lev Markiz – who I worked with when he conducted some concerts of my stuff in Holland… It’s so sad. KG replies: Thanks Gavin, lovely to hear from you. I hope those conversations will appear in print someday. I can just imagine Bob’s penetrating questions. And very sorry for your losses, it sounds like a sad time. An appalling start to the year. His biography of Vivier is so humane. Not knowing of his illness , I was shocked by the news. Can’t say more, really.- too upset. Beautifully written. I knew Bob in Belfast and then when he had moved to Dartington. He will be deeply missed by so many. Devastating news. I too was lucky enough to sit and wax lyrical in his flat in dartington. He was so unassuming and when his light shone in your direction, one suddenly felt like you could achieve so much more. His humility and enthusiasm was infectious. We kept in touch years afterwards and was unaware of his illness. I can’t express how sad I am. Sending love to his family. I was a student of Bob’s at Brunel. His love of Phill Niblock rubbed off on me, and his kindness at getting me involved with countless interesting things during and after my time at Brunel has had a huge impact on what I’m doing now, and who I am. My heart breaks that I no longer have the chance to repay his generosity. A wonderful posting about a brilliant man. In knew Bob from our days together as students at the University of York. One day I had the open window to my apartment and in walked Bob and he kindly asked if he could listen to the music that was playing on my stereo. We were great friends and “musical brothers” ever since. Bob and myself attended concerts together up and down the UK (sometimes with his brother Steve). We also played together in the “legendary” Mome Raths Outgrabe at York. I could write more … but I am still in tears upon hearing the sad news. You have moved beyond your suffering to a place that is better than this. I will miss your company and the many many laughs that we shared together in this life. Bob came to stay Cincinnati when he was carrying out his seminal research on Harry Partch in San Diego. I’m stunned by this news. Bob was always such an encouragement to me in my own Partch research and I can’t imagine the world without more of his insight and decency. Kyle – I, too, am still speechless after these many days….so many memories, for over 20 years. Were it not for Bob, the band PARTCH would not exist – he helped inspire my first instrument [Adapted Guitar I, Barstow version], and even came to LA for the birth of our Marimba Eroica last year. We toured Holland in 2002 for a few weeks, spreading the HP gospel with 2 Adapted guitars, 2 Adapted Violas, and a Diamond Marimba. He wrote the program notes for our BITTER MUSIC recording, our just released PLECTRA & PERCUSSION DANCES, as well as the RUMINATIONS disc of Ben Johnston’s music. A thousand letters and emails between us kept us in touch when not face-to-face….I can still remember a wonderful concert he arranged for me in Amsterdam in the Pianola Museum, playing Partch & Johnston, our shared obsessions (among so many others). There never walked a more humane, insanely funny, transcendentally musical & aesthetically well-tuned human…..(ok, except perhaps you…). At this point, all we can do is celebrate all that he has left us – in words, notes, and deeds – cherish the memories and insights, the flashes of laughter and inspiration. There rests near my music stand a photo of Bob holding Elisabeth’s first Adapted Viola – it’s been there for a decade. With his fierce stare and twinkling eyes, he still urges me on……daily.